The distortion of a Pope's speech on Vietnam state media has cast shadows of sadness among Catholics, and led to an on-going string of arrests. A catechumen blogger who has been actively defending the Church in Vietnam was arrested on Thursday Aug. 27 and others are facing the same risk of arrest for their swift reactions against the distortion of Pope Benedict XVI's speech to Vietnamese bishops on their ad limina visit on June 27, 2009. On Saturday Aug. 29, Reuters reported from Hanoi: "Bui Thanh Hieu, who wrote online under pen name 'Nguoi Buon Gio', which literally means Wind Trader, was picked up by police in Hanoi on Thursday and has not answered his telephone or been heard from since, said one acquaintance, who declined to be named out of concern for his own safety." Speaking to Asia-News, Redemptorist Father Peter Nguyen Van Khai of Hanoi monastery added: "I confirm that blogger Bui Thanh Hieu, a catechumen of Hanoi Archdiocese who has been actively studying catechism in order to receive Baptism, has been detained by police since Thursday." Alarmingly, "his arrest certainly is not the last one," warned Sr. Emily Nguyen from Vinh Diocese. "Many Catholic bloggers have criticized 'a shameful distortion' by state media against Pope Benedict XVI's speech to Vietnamese bishops on their ad limina visit. They are facing possible risk of an arrest," she explained. On Aug. 24, Vietnam Net, a state media outlet, published an article titled "A good Catholic is a good citizen" in which it quoted several phrases from Benedict XVI's speech to Vietnamese bishops on June 27, 2009 to promote the idea that "Pope Benedict XVI strictly warned Vietnamese bishops to concern more about priests who should strive for holiness in order to be able to guide their flocks to live as the pope expects: 'a good Catholic is a good citizen'". Quoting two phrases from the Pope's speech: "the priest must deepen his inner life and strive for holiness', and 'Lay Catholics for their part must demonstrate with their own life, which is based on charity, honesty and love for the common good, that a good Catholic is also a good citizen". By its own account, the article seems to paint a somber picture of the Church in Vietnam in which priests have neither deepened their inner life nor striven for holiness; and lay Catholics have been neither charitable, nor honest, thus can't be good citizens. Obviously, it tries to make an impression on readers that Pope Benedict XVI himself had insulted the Church in Vietnam for its spiritual corruption," said Hanoi's Fr. Joseph Nguyen. At the meeting with Vietnamese bishops, Pope Benedict XVI told them: "You know, as well as I do, that healthy collaboration between the Church and the political community is possible." The sentence was seized as "crystal clear evidence" that Church leaders in Vietnam have not been following the policy of peaceful dialogue with the government, yet maintaining a hostile attitude against the communist government. The government has refused any dialogue and later decreed to bulldoze the Tam Toa church while police and groups of thugs in Dong Hoi city have taken the streets and attacked those whom they saw wearing Catholic religious symbols. The article also went as far as interpreting the "healthy collaboration between the Church and the government" that Pope Benedict XVI suggested as the submission of Catholics to the communist government. "In essence, we have been alarmed and disgusted at the attempt of the writer to depict The Successor of Peter as an ally of one of the most tyrannical regimes in the world, and its implication that the Church would require complete submission to government in all circumstances" Fr. Joseph Nguyen added. More outrageously, a phrase in the speech when Pope Benedict XVI stated: "Her [the Church] intention is certainly not to replace government leaders", was interpreted as Vatican had known in advance a plot of Catholic priests to overthrow the government, suggesting all Vietnamese bishops to extinguish such attempts at once. "The next day, television channels, radio stations, and newspapers re-broadcasted the article with great emphasis and calls for urgent arrests and punishments against some Catholic priests in Thai Ha and Vinh diocese," Sr. Emily Nguyen reported. This is not the first time state media has distorted of Catholic leaders 'statements to incite violence against Catholics. Almost a year ago, reporting on the meeting between the delegation of Hanoi archdiocese's office, led by the archbishop himself; and Hanoi People's Committee, led by chairman Nguyen The Thao on Sep. 20 2008, state media had seized on an isolate phrase in a comment by the archbishop and pulled it out of context in order to condemn him. Here is the full text of his comment: "Hence, we want to repeat here our wish to build up the nation as a great united block. Travelling overseas often, we feel humiliated to be carrying a Vietnamese passport because wherever we go, we are always examined scrupulously [by customs agents]. We are really sad. We desire our country becomes stronger so that we can be like Japanese citizens who can pass through everywhere without being inspected. Koreans already enjoy that. We hope Vietnam becomes a strong, united country, so that we are respected everywhere we go." His comment was condensed by state-controlled media into a few words: "we feel humiliated to be carrying a Vietnamese passport" in order to condemn him of smearing the nation, and thus causing the fury of people in the capital. Obviously, the quote was left out of context to interpret the speaker's comment in the opposite way. The next day at the sacred shrine of Our Lady at Thai Ha parish at 0:05 am Monday Sep. 22 2008, it would make one's hair stand on end listening to the scream of hundreds of government thugs who in their fury smashed everything within their reach, shouting slogans and calling for Archbishop Joseph Ngô Quang Kiệt's head. It should be noted that everything happened clearly in view of a large number of officials who were in charge of keeping security and safety in the area. For months following the incident, the archbishop had been under virtual house arrest. The archbishop's office was closed. His staff had locked the gate outside the office to prevent sudden attacks by the pro-government mobs that gathered regularly outside, yelling slogans in praise of Communism and questioning the prelate's patriotism. Some of his normal activities had also been delayed or cancelled due to security reasons. Archbishop Ngo could not leave his residence without confronting the mobs, and the faithful dared not call on him for the same reason. The distortion of a statement of the highest leader of Catholics in the world has cast shadows of doubt and frustration among Catholics throughout Vietnam and abroad. Catholics have since shown strong, swift, defiant reactions through Internet blogs - the unique way to express peacefully their opinions as all other public media are in state control. 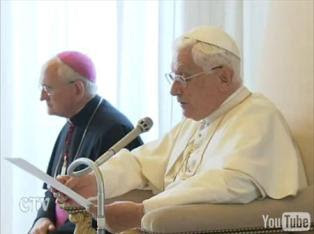 Some have simply delivered the Vietnamese translation of the Pope Benedict XVI's speech. Others have argued that the Church would not require her faithful to obey unquestioningly tyrants and governments which promote injustices and policies that go against Church teaching. "Surely, no Catholics should follow the policy of Population Control through Abortion as Family Planning. they should rather condemn it," blogger An Dan wrote. Arguments on the submission to government have gone as far as calls into question the very legitimacy of the communist's rule. Some bloggers have argued that a government has just power only if that power has been bestowed by the people. Historically, communists took control of the government by violent force, and so far no democratic elections have been held. Vietnamese government seems to be ready to take extreme steps to silence the dissents. Hieu's arrest occurred just days after another dissident blogger Huy Duc, a journalist of the newspaper Saigon Tiep Thi (Saigon Marketing) was told to leave the newspaper he worked for. Early this week, he had been forced to leave the paper due to his posting that praised the fall of the Berlin Wall and criticized the former Soviet Union's Communist leaders, saying their rule had led to years of misery for the people of Eastern Europe. Notably, the wall was referred in his article as "the wall of shame". The fate of the bloggers remains unknown as of now, even to their families. Thật là niềm vui mừng lớn lao khi tôi được tiếp đón Anh Em, các mục tử của Giáo Hội Công Giáo tại Việt Nam. Cuộc gặp gỡ của chúng ta có một ý nghĩa đặc biệt trong những ngày này khi toàn thể Giáo Hội trọng thể mừng kính các Thánh Tông đồ Phêrô và Phaolô, và cuộc gặp gỡ này đối với tôi là một sự nâng đỡ lớn lao vì tôi vẫn biết các mối dây liên hệ thật sâu xa trong sự trung thành và tình thương mà các tín hữu của xứ sở của Anh Em vẫn có đối với Giáo Hội và đối với Đức Thánh Cha. Chính tại Mộ của hai Vị Tông đồ Cả mà Anh Em đến để bày tỏ sự hiệp thông của Anh Em đối với Người Kế vị thánh Phêrô và tăng cường sự hiệp nhất cần phải luôn được thể hiện giữa Anh Em và phải lớn lên thêm nữa. Tôi cám ơn Đức cha Phêrô Nguyễn Văn Nhơn, Giám mục giáo phận Đà Lạt, Chủ tịch Hội đồng Giám mục của Anh Em, vì những lời thân thương mà ngài đã nói với tôi nhân danh Anh Em. Xin cho phép tôi chào thăm cách đặc biệt các giám mục được bổ nhiệm tại Việt Nam từ lần thăm viếng ad limina cuối cùng trước đây. Tôi cũng muốn tưởng nhớ ở đây Đức Hồng y đáng kính Phaolô Giuse Phạm Đình Tụng, Tổng Giám mục Hà Nội trong nhiều năm. Cùng với Anh Em, tôi tạ ơn Thiên Chúa vì lòng nhiệt thành mục tử mà Ngài đã thể hiện cách khiêm nhường trong tình yêu hiền phụ sâu xa đối với đoàn dân của Ngài và với tình huynh đệ lớn lao đối với các linh mục. Chớ gì gương thánh thiện, khiêm tốn, lối sống đơn sơ của các vị mục tử vĩ đại của xứ sở của Anh Em, trở nên cho Anh Em những gương khích lệ trong sứ vụ giám mục khi phục vụ dân tộc Việt Nam, dân tộc mà tôi biểu lộ lòng trân trọng sâu xa. Anh Em trong Hàng Giám mục thân mến, Năm Linh mục vừa bắt đầu được mấy ngày qua. Năm này cho phép chúng ta làm sáng tỏ sự cao cả và vẻ đẹp của sứ vụ của các linh mục. Tôi vui mừng tỏ lòng biết ơn các linh mục giáo phận và các linh mục tu sĩ của xứ sở của Anh Em vì đã hiến dâng đời sống cho Chúa và vì những cố gắng mục vụ để mưu cầu công việc thánh hóa Dân Thiên Chúa. Anh Em hãy lo lắng cho họ, hãy bày tỏ tràn đầy lòng cảm thông và hãy giúp đỡ các linh mục để hoàn thành việc thường huấn của họ. Để trở nên người hướng đạo chính thực và theo như lòng Chúa và để theo đúng các giáo huấn của Giáo Hội, linh mục phải đào sâu đời sống nội tâm và lo hướng tới sự thánh thiện như Cha sở thánh thiện và khiêm nhường của họ Ars đã tỏ ra. Sự phát sinh dồi dào các ơn gọi linh mục và tu sĩ, nhất là trong đời sống thánh hiến của nữ giới, đó là một ơn huệ mà Chúa Kitô ban cho Giáo Hội của Anh Em. Chúng ta hãy cảm tạ Thiên Chúa vì những đặc sủng riêng này và Anh Em đang khuyến khích nhưng vẫn tôn trọng và cổ võ. Trong Bức Thư Mục vụ năm vừa qua, Anh Em đã biểu lộ mối quan tâm đặc biệt đối với các tín hữu giáo dân khi làm cho rõ ràng vai trò của ơn gọi của họ trong phạm vi gia đình. Thật là điều rất đáng mong ước, đó là mỗi gia đình công giáo, trong khi dạy cho con cái biết sống hòa hợp với Phúc Âm qua một lương tâm ngay thẳng, trong sự liêm chính và sự thật, thì gia đình trở nên trung tâm các giá trị và đức tính nhân bản, một trường dạy đức tin và tình yêu đối với Thiên Chúa. Còn phần họ, các giáo dân công giáo phải làm sao tỏ ra bằng đời sống của họ dựa trên đức ái, sự lương thiện, việc quý trọng công ích, vì mỗi người công giáo tốt cũng là một công dân tốt. Để được như thế Anh Em hãy chú ý cẩn thận mà tạo cho họ có được việc huấn luyện tốt trong khi cổ võ đức tin và trong mức độ văn hóa để họ có thể phục vụ hữu hiệu Giáo Hội và xã hội. Tôi muốn trao phó một cách đặc biệt cho sự lo lắng ân cần của Anh Em các người trẻ, đặc biệt là các người trẻ tại nông thôn là những người đang bị cuốn hút về thành phố để thăng tiến học hành cấp cao hơn và để tìm được việc làm. Mong rằng Anh Em tìm ra được đường hướng mục vụ thích hợp cho các người trẻ di dân trong nước này, qua việc tăng cường sự hợp tác giữa các giáo phận gốc của người trẻ và các giáo phận họ đến và bằng việc đưa ra các lời khuyên bảo trong phạm vi luân lý và các chỉ dẫn thực hành. Giáo Hội tại Việt Nam hiện đang chuẩn bị mừng 50 năm thành lập Hàng Giáo Phẩm tại Việt Nam. Việc mừng biến cố này sẽ được đánh dấu cách rất đặc biệt bằng Năm Thánh vào năm 2010, sẽ làm cho Giáo Hội này hăng say chia sẻ niềm vui đức tin với tất cả mọi người Việt Nam trong khi canh tân những dấn thân truyền giáo. Ơn huệ này đã được tiếp nhận cách quảng đại, đã sống và được chứng nhận bằng đông đảo các Vị Tử đạo, là những người muốn loan báo chân lý và tính phổ quát của niềm tin vào Thiên Chúa. Theo ý nghĩa này, chứng tá về Chúa Kitô là một việc phục vụ cao cả nhất mà Giáo Hội có thể hiến tặng cho dân tộc Việt Nam và cho tất cả mọi người tại Á Châu, bởi vì nó đáp ứng lại sự tìm kiếm sâu xa chân lý và các giá trị bảo đảm cho sự phát triển nhân bản toàn diện (x. Giáo Hội tại Á Châu). Trước những thách đố thật nhiều mà chứng tá này hiện đang gặp phải, thì một sự hợp tác chặt chẽ giữa các giáo phận với nhau, giữa các giáo phận với các dòng tu, cũng như giữa các dòng tu với nhau là thật cần thiết. Bức thư mục vụ mà Hội đồng Giám mục của Anh Em công bố năm 1980, nhấn mạnh về điểm "Giáo Hội Chúa Kitô giữa lòng Dân Tộc". Trong khi đem tới cái cá biệt của mình – là việc loan báo Tin Mừng của Chúa Kitô – Giáo Hội đóng góp vào việc phát triển nhân bản và thiêng liêng của con người, nhưng cũng đồng thời đóng góp vào sự phát triển của xứ sở. Việc tham gia vào tiến trình này là một bổn phận và một sự đóng góp quan trọng nhất là trong lúc mà nước Việt Nam cũng đang nhận ra việc từ từ cởi mở đối với cộng đồng quốc tế. Anh Em cũng như tôi đều biết rằng một sự hợp tác lành mạnh giữa Giáo Hội và cộng đồng chính trị có thể thực hiện được. Về điểm này, Giáo Hội mời gọi các phần tử của mình dấn thân một cách lương thiện để xây dựng một xã hội công bằng, liên đới và bình đẳng. Giáo Hội không đòi hỏi phải thay thế các nhà trách nhiệm của Chính Phủ, nhưng chỉ mong rằng Giáo Hội có thể, trong tinh thần đối thoại và hợp tác tôn trọng nhau, góp phần xứng đáng vào sinh hoạt quốc gia, vào việc phục vụ tất cả người dân. Trong khi tham gia cách tích cực, theo như chỗ đứng xứng đáng dành cho mình vào theo ơn gọi cá biệt của mình, Giáo Hội không bao giờ miễn trừ cho mình việc thực hành bác ái theo như các hoạt động được tổ chức của các tín hữu, và, đàng khác, không bao giờ có một tình trạng trong đó mà người ta lại không cần tới bác ái của mỗi Kitô hữu, bởi vì con người, ngoài công bình ra, vẫn cần và sẽ còn cần tới tình yêu (Tđ. Thiên Chúa là tình yêu, s. 29). Ngoài ra, tôi thấy điều này là quan trọng là phải nhấn mạnh rằng các tôn giáo không gây ra một mối nguy hiểm cho tình đoàn kết quốc gia, bởi vì tôn giáo nhằm giúp đỡ cá nhân thánh hóa chính mình và, qua các cơ chế, các tôn giáo quảng đại tự đặt mình phục vụ tha nhân trong cách thế hoàn toàn vô vị lợi. Kính thưa Đức Hồng y, Anh Em trong Hàng Giám mục, khi Anh Em trở về nhà, xin Anh Em hãy chuyển lời chào thăm nồng nhiệt của Đức Giáo Hoàng tới các linh mục, tu sĩ nam nữ, tới các chủng sinh, các giáo lý viên và tới tất cả tín hữu, nhất là những người nghèo khổ và đau đớn phần hồn và phần xác. Tôi nồng nhiệt khuyến khích tất cả hãy trung thành với đức tin đã lãnh nhận từ các Thánh Tông đồ mà họ là chứng tá quảng đại trong các hoàn cảnh thường là khó khăn và hãy khiêm nhường tỏ ra sự kiên quyết mà Tông Huấn "Giáo Hội Tại Á Châu" (s. 9) đã chân nhận như là đặc tính của họ. Xin Chúa Thánh Thần của Đức Kitô là Vị hướng đạo và là sức mạnh cho họ. Tôi trao phó Anh Em cho sự che chở hiền mẫu của Đức Mẹ La Vang và nơi sự bầu cử của các Thánh Tử đạo Việt Nam, tôi vui lòng ban cho tất cả Phép Lành Tông Tòa trong tình thân mến. I receive you with great joy, Pastors of the Catholic Church in Vietnam. 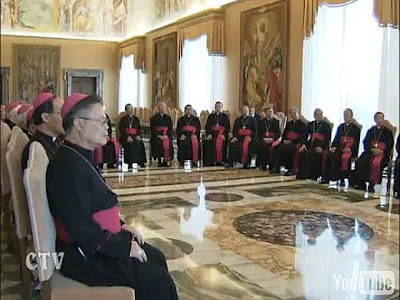 Our meeting acquires special significance during these days when the whole Church is celebrating the Solemnity of the Apostles Peter and Paul, and it is a great comfort to me for I know the deep links of fidelity and love that the faithful of your country feel for the Church and for the Pope. You have come to the tombs of these two Princes of the Apostles to express your communion with the Successor of Peter and to reinforce the unity that must always unite you and that must continue to grow. I thank Bishop Pierre Nguyên Vãn Nhon, Bishop of Ðà Lat, for his kind words on your behalf. Allow me to greet in particular the Bishops who have been appointed since your last ad limina visit. I would also like to remember venerable Cardinal Paul Joseph Pham Ðinh Tung, Archbishop of Hanoi for many years. With you, I thank God for the pastoral zeal he exercised humbly in profound fatherly love for his people and great brotherhood for his priests. May the example of holiness, humility, simplicity of life of the outstanding Pastors of your country be for you incentives in your episcopal ministry at the service of the Vietnamese people, to whom I wish to express my high esteem. Dear Brothers in the Episcopate, the Year for Priests began a few days ago. It will bring into the limelight the greatness and beauty of the ministry of priests. I would be grateful if you would kindly thank the diocesan and religious priests of your beloved country for their lives consecrated to the Lord and for their pastoral efforts with a view to the sanctification of the People of God. Be concerned for them and full of understanding, and help them to complete their continuing formation. If he is to be an authentic guide conformed to the Heart of God and the teaching of the Church, the priest must deepen his inner life and strive for holiness after the example of the humble Curé d'Ars. The flourishing of priestly and religious vocations, especially in the consecrated life of women, is a gift of the Lord for your Church. Let us give thanks to God for their charisms, which you encourage by respecting and promoting them. In your Pastoral Letter last year you paid special attention to the lay faithful, highlighting the role of their vocation in the family context. It is to be hoped that every Catholic family, by teaching their children to live in accordance with an upright conscience, in loyalty and truth, may become a home of values and human virtues, a school of faith and love for God. Lay Catholics for their part must show by their life, which is based on charity, honesty and love for the common good, that a good Catholic is also a good citizen. For this reason you must ensure that they have a sound formation, by promoting their life of faith and their cultural standard so that they may serve the Church and society effectively. I would like to entrust to you the young people in particular, especially rural youth who are attracted by the city to continue their advanced studies in it and to find jobs. It would be desirable to develop appropriate pastoral care for these young internal migrants, starting by strengthening, here too, collaboration between the young people's original dioceses and the host dioceses and by being unsparing in ethical advice and practical directives. The Church in Vietnam is currently preparing to celebrate the 50th anniversary of the establishment of the Vietnamese episcopal hierarchy. This celebration which will be especially marked by the Jubilee Year 2010, will enable it to share the joy of faith enthusiastically with all the Vietnamese, in renewing their missionary commitments. On this occasion the People of God must be asked to give thanks for the gift of faith in Jesus Christ. This gift was generously received, lived and witnessed to by numerous martyrs who wished to proclaim the truth and universality of faith in God. In this regard, witness born to Christ is a supreme service that the Church can offer to Vietnam and to all the peoples of Asia, because it responds to the profound research for the truth and values that guarantee integral human development (cf. Ecclesia in Asia). In the face of the many challenges that this witness currently encounters, closer collaboration is necessary between the different dioceses and between the dioceses and religious congregations, as well as within them. The Pastoral Letter that your Bishops' Conference published in 1980 emphasized "the Church of Christ in the midst of his People". In contributing her specific message, the proclamation of the Good News of Christ, the Church is contributing to the human and spiritual development of people, but also to the development of the country. Her participation in this process is a duty and an important contribution, especially at the time when Vietnam is gradually opening to the international community. You know, as well as I do, that healthy collaboration between the Church and the political community is possible. In this regard, the Church invites all her members to be loyally committed to building a just, supportive and fair society. Her intention is certainly not to replace government leaders; she wishes only to be able to play a just role in the nation's life, at the service of the whole people, in a spirit of dialogue and respectful collaboration. By active participation in her own province and in accordance with her specific vocation, the Church can never be exempt from practising charity as an organized activity of believers, and on the other hand, there will never be a situation where the charity of each individual Christian is unnecessary, because in addition to justice humans need, and will always need, love (Deus Caritas Est, n. 29). Furthermore, it seems important to me to emphasize that religions do not represent a threat to the nation's unity since they aim to help individuals to sanctify themselves and through their institutions desire to put themselves generously and impartially at the service of their neighbour. Your Eminence, dear Brothers in the Episcopate, on your return to your country, please convey the Pope's warm greeting to the priests, men and women religious, seminarians, catechists and all the faithful, especially to the poorest and to those who suffer physically and spiritually. I warmly encourage them to stay faithful to the faith received from the Apostles, whose generous witnesses they are, in conditions that are often difficult, and to show the humble firmness which the Apostolic Exhortation Ecclesia in Asia, n. 9) recognizes as one of their characteristics. May the Lord's Spirit be their guide and their strength! As I entrust you to the motherly protection of Our Lady of La Vang and to the intercession of the holy Martyrs of Vietnam, I impart to you all an affectionate Apostolic Blessing. Chúa Giêsu và các môn đệ của Người đi tới các làng xã vùng Xêdarê Philípphê. Dọc đường, Người hỏi các môn đệ: "Người ta nói Thầy là ai?" Các ông đáp: "Họ bảo Thầy là ông Gioan Tẩy Giả, có kẻ thì bảo là ông Êlia, kẻ khác lại cho là một ngôn sứ nào đó". Người lại hỏi các ông: "Còn anh em, anh em bảo Thầy là ai?" Ông Phêrô trả lời: "Thầy là Ðấng Kitô". Chúa Giêsu liền cấm ngặt các ông không được nói với ai về Người. Rồi Người bắt đầu dạy cho các ông biết Con Người phải chịu đau khổ nhiều, bị các kỳ mục, thượng tế cùng kinh sư loại bỏ, bị giết chết và sau ba ngày, sống lại. Người nói rõ điều đó, không úp mở. Ông Phêrô liền kéo riêng Người ra và bắt đầu trách Người. Nhưng khi Chúa Giêsu quay lại, nhìn thấy các môn đệ, Người trách ông Phêrô: "Xatan! lui lại đàng sau Thầy! Vì tư tưởng của anh không phải là tư tưởng của Thiên Chúa, mà là của loài người". Rồi Chúa Giêsu gọi đám đông cùng với các môn đệ lại. Người nói với họ rằng: "Ai muốn theo tôi, phải từ bỏ chính mình, vác thập giá mình mà theo. Quả vậy, ai muốn cứu mạng sống mình, thì sẽ mất; còn ai liều mất mạng sống mình vì tôi và vì Tin Mừng, thì sẽ cứu được mạng sống ấy. Trong đời sống đạo cũng đã có những hiểu lầm như thế. Người ta cứ tưởng Đấng Cứu thế sẽ uy nghi từ trên mây trời hiện đến. Không ngờ Người lại do một thôn nữ dưới đất sinh ra. Người ta cứ tưởng Đấng Cứu thế phải ngự trong lâu đài sang trọng của vua chúa. Nhưng không ngờ Người lại sinh ra trong chuồng bò lừa. Người ta cứ tưởng Đấng Cứu thế phải uy quyền lẫm liệt. Nhưng không ngờ Người lại quá hiền lành khiêm nhường. Người ta cứ tưởng Đấng Cứu thế phải đánh đông dẹp bắc, đập tan quân thù, đưa nước Do thái lên địa vị bá chủ. Nhưng không ngờ Người chịu thua hết mọi người, chịu hành hạ, chịu sỉ nhục, chịu chết như một kẻ tội lỗi. Người ta cứ tưởng Đấng Cứu thế là một ông vua có kẻ hầu người hạ. Nhưng không ngờ chính Người lại quỳ xuống hầu hạ, rửa chân cho các môn đệ. Có quan niệm sai lầm về Thiên chúa, người ta cũng sai lầm về người môn đệ. Người ta cứ tưởng theo Chúa thì sẽ được chức cao quyền trọng trong Nước Chúa. Nên bà Giê-bê-đê mới xin Chúa cho 2 người con là Gio-an và Gia-cô-bê được ngồi bên tả và bên hữu Chúa trong Nước Chúa. Nhưng không ngờ Chúa không hứa cho chức quyền mà chỉ hứa cho uống chén Người sẽ uống, nghĩa là phải chết. Người ta cứ tưởng người làm lớn trong Nước Chúa sẽ được trọng vọng, được phục dịch. Nhưng không ngờ Chúa lại bảo: "Ai trong anh em muốn làm lớn thì phải phục vụ anh em". Người ta cứ tưởng theo Chúa thì Chúa sẽ cho mọi sự may mắn ở đời, được thành công, được giàu sang. Nhưng không ngờ Chúa lại bảo: "Ai muốn theo Ta phải từ bỏ mình đi, vác thập giá mình mà theo". Hôm nay, sau khi nghe các môn đệ báo cáo về dư luận quần chúng, Chúa Giêsu thấy họ quá sai lầm về Người, về vai trò Cứu thế của Người, về con đường cứu chuộc. Nên Người đã dậy rõ ràng cho các môn đệ biết Đấng Cứu thế thực là Con Thiên chúa. Nhưng con đường Người đi là con đường thập giá. Người phải chịu đau khổ, chịu hành hạ, chịu sỉ nhụ, và phải chịu chết. Phải chăng Thiên chúa muốn hành hạ con người, muốn con người tàn lụi chứ không muốn con người phát triển, muốn con người phải chịu đau khổ chứ không muốn con người được hạnh phúc ? Tại sao trên trần gian, người ta thường hứa hẹn cho những người theo mình hạnh phúc sung sướng mà Chúa thì làm ngược lại, chỉ hứa cho những người theo mình thánh giá và đau khổ ? Chính Chúa Giêsu cũng phải đi qua con đường thập giá khổ nhục mới đến hạnh phúc. Chính Người phải kinh qua cái chết đau đớn mới tới ngày phục sinh vinh quang. Nên Chúa đã nói với các môn đệ: "Ai muốn cứu mạng sống mình, thì sẽ mất; còn ai liều mất mạng sống mình vì Tôi và vì Tin mừng, thì sẽ cứu được mạng sống ấy". 1. Đâu là những hiểu sai lầm về Chúa? 2. Đâu là những hiểu lầm về người môn đệ của Chúa? 3. Có phải Chúa muốn ta khổ sở khi bảo ta phải từ bỏ mình hay không? 4. Tại sao Chúa chịu đau khổ? Các phương tiện truyền thông đang nói nhiều đến sự ô nhiễm: ô nhiễm môi trường sinh thái, ô nhiễm nguồn lương thực, ô nhiễm âm thanh. Bên cạnh đó, các nhà giáo dục còn nói đến ô nhiễm những mặt trái của văn minh phương tây, ô nhiễm tinh thần tục hoá của một xã hội tiêu thụ và hưởng thụ. Hơn lúc nào hết, chúng ta có quá nhiều cái để nghe và cũng có quá nhiều điều để nói đang khi biết bao điều phải nghe mà chưa nghe được, bao nhiêu điều phải nói mà nói không được. Phải chăng, một cách nào đó, chúng ta cũng không hơn chi anh chàng vừa điếc vừa ngọng trong bài Tin Mừng hôm nay khi anh phải nhờ người khác dẫn mình đến với Chúa Giêsu. "Hãy sống dùm tôi, hãy nói dùm tôi, hãy thở dùm tôi…". Bài hát của một tác giả như là một lời nhắc nhở chúng ta; hôm nay, Phụng vụ Lời Chúa còn nói với chúng ta nhiều hơn. Trình thuật Tin Mừng kể chuyện Đức Giêsu chữa lành một người điếc và ngọng. Phép lạ không chú trọng đến việc chữa lành thể chất nhưng đúng hơn, chú trọng đến việc chữa trị tâm hồn. Đức Giêsu mở tai anh, để anh có thể nghe Lời Chúa; mở miệng anh, để anh có thể tuyên xưng niềm tin vào Ngài, chính Ngài là Đấng Thiên Sai đã được Isaia loan báo trước đó hơn tám thế kỷ, Ngài là Đấng mở mắt người mù, mở tai người điếc và mở miệng người câm như bài đọc thứ nhất và bài đáp ca hôm nay nhắc lại. Vậy thì Lời Chúa hôm nay nói gì với chúng ta? Hơn bao giờ hết, chủ đề điếc và ngọng thật hấp dẫn và cũng dễ đụng chạm. Nguyên chuyện khoái điếc, thích ngọng và kể cả muốn mù như căn bệnh mãn tính lâu ngày hoá quen và coi như chuyện nhỏ không thành vấn đề đã là một cái gì đụng chạm ghê gớm. Anh chị em, chúng ta sẽ đụng ai khi nói đến những căn bệnh mãn tính nầy? Và một loạt câu hỏi được đặt ra: Đụng ai trước nhất? Vì sao phải đụng? Tại sao chúng ta khoái điếc khi không còn muốn nghe? Tại sao chúng ta thích ngọng khi chẳng còn buồn nói? Ai tập cho chúng ta điếc? Ai dạy cho chúng ta câm? Có lẽ nhiều người đang nín thở, nhưng dường như tất cả chúng ta đã hiểu lầm hết với câu trả lời của mình. Còn đây mới là câu trả lời đúng nhất, chính xác nhất. Đề cập đến việc khoái điếc, thích ngọng và giả mù của chúng ta sẽ đụng chạm đến chính linh hồn, đụng chạm đến bản thân chúng ta trước nhất. Chúng ta điếc đặc trước Lời Chúa, ù loà trước tiếng lương tâm, lãng tai trước những nhu cầu của anh chị em chung quanh khi chúng ta thoả hiệp với tội lỗi, nhân nhượng với ích kỷ và sống chung với hèn nhát. Chính lúc đó, chúng ta vô tình chuốc lấy cái bệnh trụt lưỡi và cái khiếm thính mãn tính. Chúng ta sợ đối diện với Lời Chúa nên ngại đặt mình trước mặt Ngài. Vì Lời Chúa là gươm hai lưỡi, thấu suốt tâm hồn và dò xét tâm can. Lời Chúa thẳng băng, luôn mới mẻ, sẵn sàng phanh phui, không nể vì, cũng chẳng thoả hiệp. Chúng ta sợ những phút trầm tư, run rẩy, khi phải lặn sâu xuống lòng mình, bởi lẽ ở đó, tiếng Chúa đang mời gọi, tiếng lương tâm đang kêu réo ới ời. Làm sao một người làm cha làm mẹ, làm sao một mục tử, một thầy cô giáo hay một chứng tá của Chúa Kitô trong môi trường mình đang sống lại có thể yên thân? Làm sao chúng ta lại hoá như bao người khác? Mà tại sao lại phải yên thân? Đến đây, có người sẽ nói: Cuộc đời phức tạp lắm, các linh mục không biết đâu! Không, tôi biết. Vì nếu không tỉnh thức, chúng ta sẽ vô tình đánh mất sự hồn nhiên, đánh mất cả sự tự do và đánh mất chính mình. Phải, chúng ta mù loà điếc lác và ngọng miệng, một căn bệnh cần được Đức Giêsu chữa lành. Đức Hồng Y Gracias nói: "Gương mù cho thế kỷ hôm nay là chúng ta y hệt mọi người khác", dửng dưng như người khác, thờ ơ như người khác và lạnh lùng như người khác. Không, mỗi ngày, mỗi người chúng ta đều được mời gọi hướng thượng: nhanh hơn, cao hơn và xa hơn. Chúng ta là con cháu Hồng Bàng, là đại bàng sải cánh giữa lồng lộng trời cao; chúng ta không thuộc họ nhà gà lệt đệt. Bùn càng tanh, sen càng phải thơm tho. Bùn càng đặc, sen càng phải toả ngát. Cắm sâu giữa bùn nhưng sen vẫn mãi là sen vì chỉ có sen mới được quyền nói về bùn, cũng như chỉ có bùn mới được quyền nhắm mắt không thừa nhận sen. Gần bùn mà chẳng hôi tanh mùi bùn là vậy. Chuyện ngày xưa kể rằng, Mặc Tử ở nước Lỗ sang nước Tề thăm nhà bạn cũ. Người bạn cũ trách Mặc Tử: "Bây giờ thiên hạ còn ai biết đến việc nghĩa, quan lớn cũng như quan bé, mạnh ai nấy sống, lấy cái công làm cái tư, ông tự khổ thân một mình làm việc nghĩa chi cho nhọc xác?". Mặc Tử trả lời: "Tôi hỏi ông, nhà có mười đứa con, một đứa cày, chín đứa ngồi ăn, thì chẳng phải đứa cày phải cày chăm hơn sao? Bởi vì đứa cày thì ít đứa ăn thì nhiều. Thiên hạ bây giờ không ai chịu làm việc nghĩa, ông phải khuyên tôi cần làm việc nghĩa nhiều hơn mới phải chứ, sao lại ngăn tôi?". Lạy Chúa, có nhiều bức tường ngăn chặn làm tai con điếc. Có nhiều sợi dây trói buộc làm lưỡi con ngọng. Xin cũng nói với con:"Ephata, Hãy mở ra", để con nghe được tiếng Chúa, tiếng lương tâm mà hoán cải tâm hồn, đổi mới con tim. Xin hãy phá đi bức tường định kiến, bức tường ích kỷ để con mở rộng cõi lòng đón nhận Lời Chúa, đón nhận anh em. Xin hãy mở miệng lưỡi con, cắt đứt sợi dây ích kỷ, sợi dây sợ sệt, sợi dây ươn hèn để con mạnh dạn nói lời chân lý, lời thứ tha, những lời ca ngợi tình Chúa, những lời chúc khen tình người, Amen. WHĐ (19.06.2009) – Hôm nay lễ Thánh Tâm Chúa Giêsu, Đức Thánh Cha Bênêđictô XVI khai mạc Năm Linh mục cho toàn Giáo Hội Công giáo. ĐTC đề cao tấm gương thánh thiện của Cha thánh Gioan Maria Vianney cho các linh mục noi theo và đã đặt thánh nhân làm bổn mạng của các linh mục. Đồng thời, ngài khuyến khích các Giáo Hội địa phương cũng nêu cao những tấm gương linh mục trong đất nước của mình. Theo đó, Hội đồng Giám mục Việt Nam đã quyết định trong Năm Linh mục, mỗi giáo phận sẽ giới thiệu ít là hai mẫu gương linh mục và phổ biến rộng rãi cho mọi tín hữu được biết. Trong suốt Năm Linh mục, kể từ hôm nay, mỗi tuần WHĐ sẽ giới thiệu một chân dung linh mục Việt Nam. Và xin được bắt đầu với Đức Hồng y Phanxicô Xaviê Nguyễn Văn Thuận. Đức Hồng y Phanxicô Xaviê Nguyễn Văn Thuận được nhiều người biết đến như là con người của hoà bình, niềm vui và hy vọng bởi gương sống đức tin, cuộc đời mục tử với phong thái bình dị, lạc quan, xác tín và hy vọng của ngài trong mọi cảnh huống. Đức Hồng y sinh ngày 17-04-1928, tại Phủ Cam, Huế. Ông cố thân sinh là cụ Tađêô Nguyễn văn Ấm, Bà cố là Elizabeth Ngô thị Hiệp. Ngài là người con cả trong gia đình có 8 anh chị em. Sinh trưởng trong gia đình Công giáo có truyền thống đạo đức, tổ tiên từng bị bách hại vì đạo Chúa, lại được thân mẫu thường kể cho nghe hạnh các Thánh, nhất là các chân phúc Tử đạo Việt Nam, cậu bé Thuận sớm có ước muốn dâng mình cho Chúa. Gia đình cậu Thuận khá giả, thân phụ e ngại sức khoẻ kém của cậu không kham nổi cuộc sống kỷ cương chủng viện nên lúc đầu không đồng ý. Cậu phải nhờ thân mẫu can thiệp và được chấp thuận để tu học tại Tiểu Chủng viện An Ninh – Quảng Trị, sau đó học triết và thần học tại Đại chủng viện Kim Long – Huế. Ngày 11-06-1953 thầy Thuận lãnh chức linh mục tại Nhà thờ Chánh tòa Phủ Cam, Huế, do Đức cha Jean Baptiste Urruthia Thi, Đại diện Tông Tòa Giáo phận Huế chủ phong. Ngài được bổ nhiệm làm cha phó xứ đạo Tam Tòa (Đồng Hới, Quảng Bình). Sau đó, làm cha phó xứ đạo Phanxicô Xaviê, ở Huế. Sau 3 năm mục vụ, cha Thuận được cử đi du học tại Đại học Giáo hoàng Urbaniana, Roma – Italia. Trong thời gian theo học, ngài có dịp tiếp xúc với các phong trào Đạo binh Đức Mẹ, Hướng Đạo, Cursillo, Focolare và điều đó đã ảnh hưởng đến đường lối hoạt động mục vụ của ngài sau này. Năm 1959, ngài đậu bằng tiến sĩ Giáo luật với luận án "Tuyên úy Quân đội trên thế giới". Về nước, ngài dạy học tại Tiểu Chủng viện Phú Xuân, sau đó đổi tên là Tiểu Chủng viện Hoan Thiện – Huế. Là cha giám đốc nhưng ngài luôn hỏi han, tươi cười với các chú, thông cảm cho sai sót tuổi trẻ. Không thấy ngài to tiếng hay quở mắng ai bao giờ, đến nỗi cha quản lý thốt lên "Cha bề trên hiền quá, chẳng có chú nào sợ…" Thật ra, ngài chủ trương giáo dục đặt nền tảng trên yêu thương và gương sáng chứ không phải lề luật và trừng phạt. Ngài làm Tổng đại diện Tổng giáo phận Huế từ năm 1964 – 1967. Ngày 13-04-1967, cha Thuận được Đức Thánh Cha Phaolô VI bổ nhiệm làm Giám mục Giáo phận Nha Trang, kế vị Đức Cha Marcel Piquet Lợi (1888-1966). Ngài chọn khẩu hiệu "Vui mừng và Hy vọng" (Gaudium et Spes) là tên Hiến chế Mục vụ của Công đồng Vatican II. Phương châm và huy hiệu giám mục của ngài không chỉ nói lên niềm tin yêu, hy vọng của ngài đối với Mẹ Giáo Hội mà còn cho thấy tâm hồn thanh thoát, tươi trẻ, hoà bình, vị tha và hướng thượng, đã được diễn tả trong suốt cuộc đời sứ vụ mục tử của ngài. Ngày 24-06-1967, Ngài được tấn phong Giám mục tại Huế do Đức Khâm sứ Tòa thánh Angelo Palmas chủ phong và về nhậm chức ở Giáo phận Nha Trang ngày 10-07-1967. Tám năm trong cương vị chủ chăn giáo phận Nha Trang và một số chức vụ khác trong Hội đồng Giám mục Việt Nam , cũng như thành viên của Hội đồng Giáo hoàng về Giáo dân, tâm hồn mục tử của ngài trải rộng trên mọi thành phần dân Chúa. Ngài quan tâm đặc biệt đến việc phát triển nhân sự, đặt nền tảng hy vọng cho giáo phận nhà và Giáo hội địa phương. Ngài quan tâm mở mang hoặc thành lập các chủng viện, dòng tu, tu hội; tổ chức tu nghiệp và huấn luyện cho hàng giáo sĩ, giáo dân; đẩy mạnh các phong trào, hội đoàn Thanh lao công, Công lý - Hoà bình, Hướng đạo, Cursillo, Focolare… Các thư mục vụ của ngài đầy ắp tâm tình tạ ơn, hy vọng và tín thác nơi Chúa, cũng như thúc đẩy đời sống đức tin cho đoàn chiên giáo phận: "Tỉnh thức và cầu nguyện" (1968); "Vững mạnh trong đức tin, tiến lên trong an bình" (1969); "Công lý và hòa bình" ( 1970); "Sứ mạng của Chúa Kitô là sứ mạng của chúng ta" (1971); "Kỷ niệm 300 năm" (1971); "Năm thánh canh tân và hòa giải" (1973). Dù bề bộn công việc, ngài vẫn luôn vui vẻ, lạc quan, khôn ngoan và khéo léo an ủi, nâng đỡ những người đang gặp phiền muộn đến với ngài. Ngày 24-04-1975, ĐGH Phaolô VI bổ nhiệm ngài làm Tổng Giám mục Phó Tổng giáo phận Sài Gòn, hiệu toà Vadesi. Tuy nhiên, thể chế chính trị Việt Nam thay đổi (30-04-1975) và cuộc đời mục tử của ngài cũng sang trang, một trang bi hùng như Người Tôi Tớ của Chúa: tín trung, hoà bình và hoá giải màn đen của ngục tù thành ánh sáng của tha thứ, yêu thương và hy vọng. Ngày 15-08-1975, Lễ Đức Mẹ Hồn Xác Lên Trời, ngài được chính quyền mới mời và bắt giữ tại Dinh Độc Lập, bị giam cầm nhiều nơi từ Nam chí Bắc của đất nước và được trả tự do ngày 21-11-1988, nhằm ngày lễ Đức Mẹ Dâng Mình trong Đền Thờ. Thời gian 13 năm lao tù, trong đó có 9 năm biệt giam, ngài đã viết lại đường hướng tu đức và kinh nghiệm sống đức tin qua các tập sách: Đường Hy Vọng, Đường Hy Vọng dưới ánh sáng Lời Chúa và Công Đồng Vatican II, Người Lữ Hành Trên Đường Hy Vọng như là di chúc tinh thần của Ngài. Quản tù ngạc nhiên về sự bao dung của ngài, ngài trả lời: "Cho dù các anh giết tôi, tôi vẫn yêu thương các anh. Tại vì Chúa Kitô đã dạy tôi phải yêu thương tất cả mọi người, cả những kẻ thù. Nếu tôi không làm như vậy, tôi không đáng được gọi là Kitô hữu". Trong tù, có những lúc, mỗi ngày, ngài cử hành Thánh lễ với 3 giọt rượu và một giọt nước trong lòng bàn tay. Đó là Bàn thờ của ngài, là Nhà thờ Chính Toà của ngài. Ngài kể lại: "Mỗi lần như thế, tôi được dịp giang tay ra và chịu đóng đinh bản thân trên Thánh Giá với Chúa Giêsu, được uống chén đắng với Chúa. Mỗi ngày khi đọc lời truyền phép, tôi hết lòng củng cố một giao ước mới, giao ước đời đời giữa tôi với Chúa Giêsu, nhờ Máu của Chúa hoà lẫn với máu của tôi". Trong lần thứ hai sang Rôma viếng thăm và chữa bệnh năm 1991, Đức cha Phanxicô Xaviê bị ngăn trở, không thể trở về quê hương; nhưng Thánh ý Chúa nhiệm mầu đã dọn con đường mới cho người Tôi Tớ tín trung của Chúa. Ngày 09-04-1994, Toà Thánh bổ nhiệm Đức Cha làm Phó Chủ Tịch Hội đồng Giáo hoàng về Công Lý và Hoà Bình và ngày 24-06-1998, ngài được bổ nhiệm làm Chủ tịch Hội đồng. Ngày 21-02-2001, ngài được vinh thăng Hồng y. Trước và sau khi nhận chức vụ của giáo triều Rôma, ngài đã liên tục đi đến các cộng đoàn của nhiều nước trên thế giới, các đại học, các cơ quan quốc tế để giảng tĩnh tâm, giúp đào tạo và xây dựng cộng đoàn mới. Ngài luôn khơi lên lòng tôn sùng Đức Mẹ, Thánh Giuse và nhất là yêu mến Bí tích Thánh Thể, tâm tình cầu nguyện và sống giây phút hiện tại trong tinh thần phó thác. Đến đâu, ngài cũng chiếu tỏa sự an bình, bao dung, tha thứ, niềm vui và hy vọng. Đặc biệt, mùa xuân Năm Thánh 2000, ngài được mời giảng tĩnh tâm Mùa Chay cho Giáo triều Rôma khi Đức Thánh Cha Gioan Phaolô II nói với ngài: "Năm đầu tiên của ngàn năm thứ III, một người Việt Nam sẽ giảng tĩnh tâm cho Giáo triều Rôma. Hãy kể lại cho chúng tôi những chứng tá của Đức cha". Ngài còn là tác giả của những đầu sách được ưa chuộng, chứa đầy sứ điệp của tình thương, công lý và hoà bình, xây dựng và hy vọng: Năm Chiếc Bánh và Hai Con Cá, Cầu Nguyện, Hãy Trao Tặng Tuổi Trẻ Nụ Cười, Niềm Vui Sống Đạo, Sứ Điệp Đức Mẹ La Vang, Chứng Nhân Hy Vọng. Ngài vẫn thanh thản, vui tươi cả trong thời gian điều trị lâu dài và đau đớn tại bệnh viện. Trong những ngày cuối đời, khi không còn nói được nữa, ngài nằm đó, mắt nhìn chăm chăm vào Thánh Giá Chúa chịu đóng đinh trước mặt. Ngài cầu nguyện trong thinh lặng để nên đồng hình đồng dạng với Chúa Kitô trên Thánh Giá và chuẩn bị giây phút quyết liệt ra đi gặp gỡ Chúa Kitô Phục Sinh. Ngài được Chúa gọi về chiều ngày 16-09-2002 tại Rôma. Đức Thánh Cha Gioan Phaolô II đã nói trong bài giảng Thánh lễ an táng ngài: "Trong lúc chào vĩnh biệt người sứ giả anh hùng của Tin Mừng Chúa Kitô, chúng ta hãy cảm tạ Chúa vì đã cho chúng ta, nơi con người của Đức Hồng y, một tấm gương sáng ngời về đời sống tín hữu Kitô, phù hợp với đức tin, cho đến độ tử đạo". Về phần mình, Đức Hồng y từng nói đơn sơ: "Trong vực thẳm những đau khổ của tôi, tôi không bao giờ ngừng yêu mến tất cả mọi người, tôi không hề loại trừ một ai khỏi tâm hồn tôi". Despite international pressures, Vietnamese government refuses to release a dissident Catholic priest who is in deteriorating health. "Nguyen Van Ly this time is not granted amnesty because... amnesty is only granted to persons who make progress in their rehabilitation," said Le The Tiem, Vice Minister of Public Security, in a news conference held on Monday Aug. 31. Tiem explained further that Fr. Thaddeus Nguyen Van Ly of Hue Archdiocese had received amnesty once "but then he committed new violations." On July 1, a bipartisan group of 37 US senators sent a letter to Vietnam President Nguyen Minh Triet calling for the "immediate and unconditional release" of Fr. Thaddeus Nguyen who had been sent to jail for eight years during a half-day trial in 2007 in the city of Hue for spreading propaganda against the communist state. The U.S. senators said Ly's trial appeared "seriously flawed," stressing that the pro-democracy activist was denied access to counsel and prevented from presenting a defense. "Given these serious flaws in relation to his arrest, trial and imprisonment, we request that you facilitate Father Ly's immediate and unconditional release from prison, and allow him to return to his home and work without restrictions on his right to freedom of expression, association and movement," the letter said. "Father Ly's arrest, trial and ongoing detention in this instance call into question Vietnam's commitment to these fundamental principles," they wrote. The 63-year-old priest has been jailed three times since the 1970s for a total of 14 years, and his 2007 trial drew condemnation from diplomats, Vietnam watchers and human rights groups for the one-party state that has gone to great lengths over the past year to boost its international prestige. On the occasion of the Independence Day, Triet signed the decision granting amnesty to 5,459 prisoners but not Fr. Thaddeus Nguyen. Nguyen Thi Hieu, a sister of Fr. Thaddeus Nguyen, who visited him last Wednesday, reported "The state of my brother's health has deteriorated since mid-July, after a fall in his cell in May." "His arm and his right foot are lightly paralyzed. He was walking with difficulty and needs people at his side to help him move around the room," she said, adding prison officials had given him medication. However, Tiem said Fr. Thaddeus Nguyen "is in good health." The decision to keep jailing Fr. Thaddeus Nguyen happened just a few days after the Vietnamese Ambassador in Italy met with the Vatican Deputy Secretary for foreign relations, Monsignor Ettore Balestero, to discuss relations between Vietnam and the Vatican and recent issues regarding the Catholic Church in Vietnam. State media outlets reported: "Dang Khanh Thoai on August 22 reaffirmed Vietnam's consistent policy of respecting and protecting the people's right to religious freedom and informed the Vatican representative of the improved and more diversified religious life of Catholic followers in Vietnam, thanks to the efforts of authorities at all levels." The on-going detention of Fr. Thaddeus Nguyen and recent incidents at Tam Toa, Thai Ha, Hanoi, Hue, Vinh Long, An Giang and other provinces in the Central Highland of Vietnam have proved the opposite way: the Church in Vietnam has been persecuted more brutally than ever. State media in Vietnam recently have used words of Pope and Vatican officials to insult Vietnamese bishops, priests and faithful. "In the speech, he [Pope Benedict XVI] called on Vietnamese Catholics to contribute to the cause of national development, regarding this as 'an important obligation and contribution at this point in time when Vietnam is developing its relations with the international community. '", VOV News – a state media outlet – reported on Aug. 27. "The Pope also reminded the Roman Catholic Church in Vietnam to hold on to the principle of 'living the gospel amidst the nation', urging that 'a good Catholic follower must also be a good citizen' and reaffirming that 'the church has no intention of finding a way to replace the authorities,'" the outlet added. After the communist takeover of the North in 1954, and of the South in 1975, 2250 Catholic universities, schools, hospitals, orphanages,and Health Care centers have been seized. Most of them have been demolished to build hotels, and tourist resorts or to award communist officials. The Church has repeatedly asked for rights to participate in education, health care and other social services but so far she has been banned to do so except the permission to run a couple of leprosy and AIDS centers. This is a clear attempt to stigmatize the demonstrations of Catholics in recent months, the commitment of priest to justice and human rights, the involvement of lay people who strive to defend the rights of religious freedom.